I’ve been following Spencer’s blog, NichePursuits.com, for quite some time now and I’ve always been a huge fan. In this interview, you’ll learn about what’s working with SEO and how Spencer created a leading software product with no technical experience at all! Steve: Welcome to the My Wife Quit Her Job Podcast, today I’m thrilled to have Spencer Haws on the show. Now I’ve actually been following Spencer for quite some time now. He runs the popular blog nichepursuits.com, where he teaches others how to start niche online businesses. Now he’s also the creator of Long Tail Pro, which is one of the best keyword research tools on the market today. And here’s what’s cool about Spencer you know for one, he’s a family man with four kids which I greatly admire, and two he’s build dozens of profitable niche sites and constantly is evolving his strategy as the internet landscape changes, and personally I love following his site and his podcasts for his insights into SEO and keyword research. And with that intro welcome to the show Spencer, how are you doing today man? Spencer: Hey I’m doing great thanks so much for having me on the podcast. I love talking business. So always enjoy doing the interviews. Steve: Yeah so you know I know a lot of people in the audience probably know who you are already, but if you wouldn’t mind giving the brief intro about how you kind of got started with this whole online thing, what your blog is all about, that’d be just awesome. Spencer: Yeah absolutely, so I started dabbling building websites just on the side, almost as a hobby, just to see if I could build websites while I was working on my full-time job. I was actually in business banking primarily in business banking and finance for about eight years and so it was back in all roughly 2006 that I started dabbling building out websites on the side just to see what I can do, not even to try and make money at first. And then sort of along the way I started learning more about okay how do you actually get traffic? What are these search engine things and how does all work? Oh I actually have to do keyword research and all these sorts of thing until eventually I was like, you know I can actually make some money if I put my mind to it and try to rank well in Google and other search engines. And so if you fast forward to 2011 by that time I had built out dozens and dozens of small niche sites that targeted a different Long Tail keywords and I was making enough money from those small niche sites, it had actually exceeded my day job income in March of 2011. And so I quit my job, and I’ve been blogging kind of about that on NichePursuits.com ever since. And of course, right around 2011 the same time I quit my job, I also went out and created the keyword research tool Long Tail Pro, which has become a big part of my business. So I’m running that software company along with creating not only niche sites now I sort of moved on to focusing on bigger sites. If you will, instead of dozens and dozens of sites I’m focusing on one or two sort of bigger sites, and of course we can dive into that. But yet I sort of I am involved in doing all those things, including buying and selling sites and shared all my blog and hopefully people reading can follow along the journey for themselves as well. Steve: I’m just curious for my own knowledge. When did the kids kind of start coming into play? Steve: And did you do all this stuff before you started having kids or…? Spencer: And so nope I did it all with the kids, with the full-time job, we now have four kids as you mentioned, and they range in ages from ten to six months. Steve: Okay and this is just for the listeners there’s no excuse for not able to start something with kids because Spencer’s got four of them. All right like I mentioned in your intro, you’ve tried a bunch of different things when it comes to making money online and that’s actually something I really admire. Now my audience is primarily composed of people who are searching for the best way for them you know from a personality standpoint to make money online. So I’d like to kind of start by talking about the beginning of your journey, where you used to own a lot more smaller niche sites that generated a smaller amount of income each and then kind of how that all evolved in to Long Tail Pro and your overall strategy today. So let’s start with the smaller niche sites, so you mention that you no longer own that many niche sites, so kind of what has involved overtime and why don’t you own as many today? Spencer: Is a good way to put, so there certain link building tactics like you know just using article directories, or other very easy to get links that you used to be able to use, those no longer works. So Google has come out with the Pad update, the Penguin updates all these algorithmic updates where they no longer are ranking these on sort of link profiles these simple you know five page niche sites. Spencer: So it’s more important now if you want to get that free traffic from Google you have to build a proper site, you have to do proper link building and content marketing, and all these tactics that you really just need to be pursuing in order to get that traffic anymore. Steve: Okay so can you just kind of quickly comment on some of these strategies and what is working and what is no longer working in SEO today? Spencer: Yeah absolutely, so there’s been you know different tactics to build links and rank in Google for a long time. And so I won’t go over all of those, but sort of one of the most recent ones that even today still a lot of people use and talk about that I no longer use is a private blog networks or PBN links. Essentially people are out building several websites and then they use this network of blogs to link to other websites. Spencer: And that’s a tactic that people have used for a long time and continue to use, but I’ve decided you know what it’s just too risky, I’m no longer going to be doing that. I want to think about what does Google want to see? I mean if a Google employee was to look at your website and to look at the links, that you’re using to try and rank your website, will they see that as a shady tactic or will they see that as you know something valuable, are these real and actual links. And so I’m out trying to pursue the more natural links you know that you get when you produce great content, you know you produce something awesome and people take notice and they want to link to it, they want to mention on their blog. Those are the types of links that you want to pursue these days. Steve: Okay and then for the people who don’t follow your blog is there a reason why you did a 180 just recently on the PBNs? Spencer: Yeah so– you know it’s– that’s kind of a painful question you know. But of course, you know there’s always a reason why strategies change because I had been using PBNs previously on several of my niche sites, and on a lot of those links got devalued. Basically one of the networks that I was using, whether it was that Google found out, or what exactly happened, but Google no longer found value in those links. And because of that all of– not all but a lot of my niche sites were penalized in the rankings so they no longer ranked well, and so yeah I went from on some of my– a couple of you know the sites that I had earning you know a couple thousand dollars to now earning you know may be a couple hundred dollars. Spencer: You know and so some of my sites were penalized. It kind of opened my eyes and said you know what if I want to do this long term, I really need to take a long term approach, and use those strategies that will be around for a long time. Steve: Okay. And so, in terms of building links today which is probably still the primary indicator of rankings today, would you agree with that? Spencer: Yeah it still is yep. Steve: Okay, so given that the PBNs and the easier ways to obtain links are kind of being slowly devalued away, what are some low hanging fruit ways of building links today in your opinion, like what do you do with the niche site today when you’re first starting out? Spencer: Yes so there’s so many different things that you can do. When it comes down to it and I don’t know if this is a low hanging fruit, but it’s something that works all the time. Spencer: And that is just creating a really great resource and this doesn’t have to be difficult, and it’s hard to sort of explain, but this could just be a huge list post. You know you combine a list of the top 100 whatever you know those are sort of some things that work well you know. So a huge resource, a huge list post or something that you produce on your blog, and then you reach out to the top you know 100 or 150 people in your niche other bloggers either via twitter or e-mail and say hey I just produced this awesome resource you know, would you mind re-tweeting this or would you mind mentioning it. You know just reach out to people that are in your niche and you will get a certain percentage that will link to that, whether that’s 5% or 10% you know I don’t know. And it kind of depends, but that’s just a great strategy that can get links. Steve: Interesting, so I actually get those e-mails almost every other day and I tend to ignore them, so I was just wondering if you had a strategy for reaching out. Spencer: And do put links on their websites. But another strategy is to reach out via Twitter; it’s so much easier to ask somebody to, hey will you re-tweet this? Rather than, hey will you put a link on your blog for me, and so you can get shares on Twitter very easily. It’s not that difficult for somebody to hit the re-tweet button and that’s all they have to do. Spencer: And those re-tweets and re-shares can get your information, can get your content in front of other eyeballs and that will lead to sort of natural links on the back and other people that maybe you didn’t reach out to will see it and will indeed link to that. Steve: Okay and then the way you kind of build out your relationships do you do cold e-mail? Do you go to conferences? How do you cut it build up your network? Spencer: Yeah, I mean all of the above and it kind of depends on what type of site perhaps that you are building, is this your only site? Certainly if you have just one site and you’re focusing on that one site only attending the conferences and you know trying to go out and do guest posts and reaching out to everybody is the way to go. If you have a few sites you might need to do some other things, where it’s more cold e-mails, and contacting people in a larger manner I guess if you will. Spencer: That can work and of course this is just one you know tactic. There’s lots of other things that you can do as well. Steve: Okay and I’m going to ask you some leading questions to get the Long Tail Pro here. So how important is the actual keywords that your targeting in terms of ranking and search? Spencer: You know it really is still critical, it is. Spencer: I mean when people– people search for things using keywords. That’s just the way the search engines work, and so it doesn’t matter how authoritative, I mean let’s take a super authoritative website you know Whitehouse.gov. You know it doesn’t show up for searches that it’s not related to right, so it’s never going to show up for the search term dog training even though it’s maybe the most authoritative website out there. There’s so much more to ranking in Google than authority. There is relativeness. Okay, so there’s how relevant is the keyword to the website? So when you do keyword research and you want to rank for a certain term, it is so critical that you look at not only you know how many people are searching for things each month and other things related to the keyword stats themselves, but how competitive is the first page of Google for this particular search term. And so you know I can’t harp on it enough that if you want to rank in Google, you have to be doing keyword research. Steve: And it’s also important in your opinion right to create something that’s very focused on the keywords that you’re trying to target, right? Spencer: Yes, absolutely. So you want to you know include the keyword in the title of your page and you want it to be related you know just by simply mentioning sort of off handedly in one of your blog post probably isn’t going to get you to rank for that keyword. You need to make it a focus of that blog post, a focus of that website to give it the attention it deserves to create a great resource surrounding that one particular keyword. Steve: Okay then prior to you having Long Tail Pro, how were you doing this niche research? Spencer: That I used, and I also used other tools are out there like Market Samurai that help you get the search volume and other keyword stats related to those keywords. But I really I wasn’t happy with the options that were out there because it took a long time to do a lot of keyword research just for different reasons. Some of the limitations of the keyword tools wouldn’t let you search for a lot of keywords very quickly, and so that’s one of the main reasons I went on decided to create my own keyword research tool. Steve: Okay, and then so what sets Long Tail Pro apart from let’s say Market Samurai. Spencer: Yeah, so one of the key differences is like I mentioned just the ability to do lots of keyword research quickly, and specifically Market Samurai only allows you to input one seed keyword at once, you input that one seed keyword to get back 800 related results. And if you don’t see anything you like you have to then go back and input another seed keyword and go through the whole process. Whereas Long Tail Pro you can input let’s say 10 seed keywords at once and you know get back 800 results for each of those or 8000 results overall. And so you can look at lots of keywords and filter them all at once to really give you sort of the best of the best keywords very quickly. So it’s a huge timesaver, it’s faster overall just the workflow, and it gets you the results in an easy to use manner. So overall it’s just faster and easier to use. Steve: Okay and then you’re not technical, right are you? Are you a programmer? Spencer: I am not a programmer. Spencer: So I’ve had to hire a developer to help me build out the software itself yeah. Steve: So let’s say you want to develop Long Tail Pro from scratch, how you find the programmers to help you? Spencer: Yeah you know it is not an easy task I’ll tell you that. You know I, when I first created Long Tail Pro I hired somebody didn’t really know what I was doing, and you know long story short, that first version of Long Tail Pro no longer exists. I immediately had to go back and hire somebody else to do it properly if you will. So you know my advice well okay, so the way that I found my programmer is actually on Elance.com. Spencer: I lucked out a little bit, but my advice is just communicate as much as possible before you hire anybody whether that’s through Skype, through phone calls, e-mails, make sure that both of you are on the same page and that you’re communicating well with what’s expected during the project, what’s expected after the project and everything. Another big piece of advice that I give is to hire somebody that’s great, not somebody that is cheap, and so usually I’m willing to pay top dollar if it’s the best programmer out there. Usually you make up so much money on the back end when you get a great developer because they do it right the first time, or they understand your project better. There’s usually a good reason that they cost more. Steve: Okay and then do top programmers hang out Elance? Spencer: Luckily I found some and yes I will say that there are other great programmers out there, they you know I don’t know if they’re few and far between, but you certainly have to weed through a lot of applicants to find the best. Steve: Okay and so let’s say okay you’ve already started developing Long Tail Pro at this point, and it comes time to market the tool, but then you didn’t come first right? Guys like Market Samurai came before you, and so how did you kind of market your tool and unseat some of the industry leaders like Market Samurai? 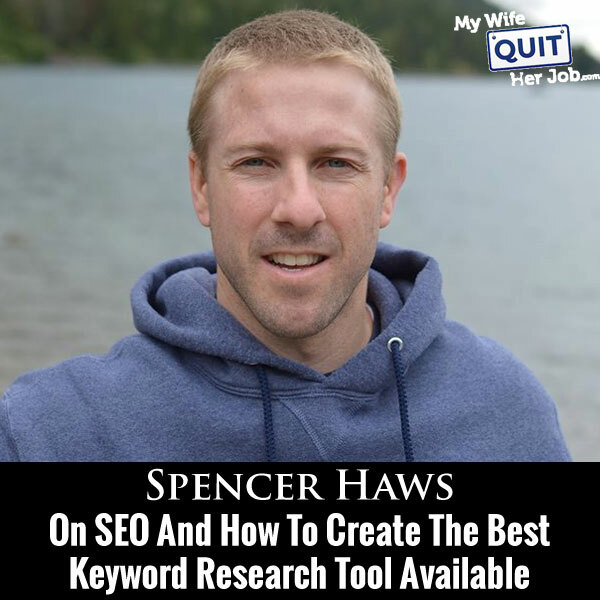 Spencer: Yeah, absolutely so one of the reasons that I felt like I could sort of make a dent in the market is because I was the primary market for keyword research tools. I was you know the person that was out buying these and doing lots and lots of keyword research. So I understood the market intimately well, and in fact I still believe that I understand the market way better than the guys in Market Samurai. Spencer: Those guys are they’re developers, they’re programmers they– I could be wrong but I don’t think they’re guys that are out doing lots of keyword research. They came up with a great initial product idea, and they developed it, but they’re marketers and developers they’re not people doing keyword research. And so for that reason there’s a few sort of quirks within Long Tail Pro that make it difficult to use and not as quick. And so by being a little bit different, to answer your question, I was just enough, my product was just enough different from Market Samurai that people were like ah I get it, I want use Long Tail Pro because input multiple seed keywords at once. Filter your keywords and all your data before you run the data. So you don’t have to go back and do it all a second time and just a lot of the way that it flowed people got it. And were like this is so much easier, it’s so much faster, I’m saving tons of time by using Long Tail Pro. Steve: Did you have the blog before Long Tail Pro or how did you get the initial people to buy? Spencer: Yeah, I did have the blog for a little while before I created Long Tail Pro, and so I did have a small e-mail list. It wasn’t huge. I try to remember, but it was you know maybe a 1000 people on my e-mail list or something like that. And so of course yes I e-mailed my e-mail list to get a few of the first sales almost more of just beta testing, but then I also did a special offer on the Warrior Forum and I got some more sales that way. And that was kind of the first version not a ton of sales if you will, but enough to kind of be out there and know that people liked it, and to give me the courage to go on and further develop, further build my audience, and further market the product. Steve: Okay, so let’s talk about the Warrior Forum a little bit. So what are kind of the rules of listing something on there? Spencer: You know on the Warrior Forum, so there’s lots of things there. Some are good, some are bad. So you have to you know if you go to the Warrior Forum you do have to weed through a lot of things to find the good and the bad products, but it is a great marketplace. There are tons of people there, tons of people looking for products to buy in the Internet marketing niche. So it was a great place for me to start because it gave me that built-in audience that you know I really didn’t have. Steve: So how do you actually get the word out about your tool today and obviously is more established now, but how do you get new customers? Spencer: Yeah so now a lot of it does come through my blog over nichepursuits.com, so a lot of my consistent just blogging and content marketing of my blog, people find out about me, and then of course find out about Long Tail Pro. So that drives a lot of traffic, but I also have a lot of affiliates that promote the software for me. People that I’ve reached out to and just build relationships with over the past three or four years that I’ve been blogging. Guys like Pat Flynn, of course you know sell quite a bit for me, Chris Guthrie, the Empire Flippers and several other affiliates that I have that just know the tool know me, and like Long Tail Pro and are willing to help me sell it. Steve: And then do they– do you buy ads as well or is it just primary affiliate network and then your blog and you podcast? Spencer: Yeah, that’s primarily it, I have tested paid traffic, but I do not do a lot of it on a regular basis. Spencer: But you know that could change like I said I’m kind of always testing and tweaking, but that really is never been a major source for me. Steve: I’m just curious in terms of your niche sites versus Long Tail Pro, like what’s the breakdown in percentage of revenue. Spencer: Yeah so Long Tail Pro has grown a ton since I launched it back in 2011 and it definitely is a majority of my business now. Spencer: I would say that it’s– let me just try to think here. You know it’s somewhere around 65-75% of my overall business. Spencer: It is probably Long Tail Pro, yeah so yeah it’s a great little business for sure. Steve: So do you feel like you kind of need to continue doing the niche research stuff to keep Long Tail Pro at the forefront in that industry? Spencer: You know I probably wouldn’t have to. Spencer: Do I feel like I need to? Yeah I enjoy it; Long Time Pro is established itself enough that you know it would do just fine without my blog I think. There is so many other things that I could be doing to promote it and it’s you know it gets mentioned on lots of blog sort of naturally without my involvement at this point. Spencer: But having said that, my first love is building niche sites and creating those sites. Spencer: And so I have no intention of giving that up. I enjoy it too much and it certainly does have a benefit. Spencer: To sort of keeping up the growth of Long Tail Pro. But that’s– you know I didn’t really create the blog because of Long Tail Pro. I really created it out of my love of just building online businesses in general. Steve: Right. And then you saw a need and you essentially just scratched your own niche so to speak, right? To fix your own problems, correct? Spencer: Yeah absolutely, for sure. Steve: So I had a couple of questions just about the economics of the software. Now I know the base versionary tools kind of this one time lifetime feed, right? But how do the economics work because I know you are probably grabbing data from the Google keyword tool also, right using the APIs. So those are constantly changing, right? Because I know Market Samurai is always breaking down because something is changing. So when you charge a onetime fee, how does it kind of work out because you have to constantly be keeping Long Tail Pro up to date, right? Spencer: Yap absolutely. So there are a lot of pieces to the puzzle. You know you mentioned one of them. There are other APIs that we use that change or you know things happen. What we do, we have to constantly be back updating the tool. And so every single month you know I’m paying a pretty descent chunk of money to my developer to keep the software up to date. Spencer: So there are a lot of ongoing course. So also to give some of the background of the stories, so there has always been a onetime purchase price for the base version of Long Tail Pro. However in I believe it was January of 2013 so about a year and a half or so after I created Long Tail Pro, I added a monthly subscription option. I added the platinum version which is a $17 a month charge for people that want to have some additional features, the platinum features. And so that has added significant stability to my overall you know month to month income and improve the economics if you will over just a onetime cost. Spencer: So that recurring piece that I’ve added was a very smart business decision. Steve: And what percentage of the people actually go platinum? Spencer: It’s a little bit over 50%. Spencer: More than half of people that buy go for the platinum option. Steve: And what do you get for platinum? Spencer: So there is a few additional features. There is the ability to add your own list of keywords if you want to add up to 10,000 keywords at once. You can throw that into the tool and I’ll give you all the data back for that. And you can save your favorites and do some other things with sorting and organizing favorite keywords that you want to highlight and save. And then the biggest function at least the people use the most is the keyword competitiveness calculations. So we’ve come up with an algorithm that calculates how difficult it would be to rank on the first page of Google for any given keyword. So you are researching you know best survival knife and the platinum version of Long Tail Pro will speed up a number between zero and 100 to tell you this is how difficult it would be to rank in Google. So it gives a very simple number that makes it really almost as easy as just glancing at the keyword, you see the number and you know how hard or easy it is to rank in Google. Steve: Okay and then does this– so I’m just trying to think of this from an ecommerce perspective. Let’s say the front page of search is full of big box stores like J.C. Penney’s, Macy’s, your algorithm kind of takes the domain authority into account in terms of ranking? Spencer: Yeah it takes a domain authority, the page authority, the number of links, and how relevant the results are to the specific keyword, and a couple of other you know little calculations in there and spits out an overall number. Steve: And I’m just curious, how do you kind of test the validity of these rankings? Spencer: Yeah so I spend a lot through my own experience you know I’ve been doing a ton of keyword research over the years. And so that specific calculation is based on a lot of my own experience that I’ve seen and tested to know whether or not you know the results are valid. So it’s one of those things that we try to stay on the forefront of sort of searching through optimization, and the most recent data that’s available and we make sure that that formula sort of matches the most up to date things that Google are doing or changing. Steve: Good because I know Moz like has a bunch of set keywords that they use for their Moz cast. Do you have like a similar way of testing, like where you have you pick some keywords in a variety of different categories and just kind of validate whether your rankings make sense? Spencer: Yes. So I you know I don’t have a specific set that I always do over and over again I guess if you will sort of like that, but I am in there testing across various niches and of course we get a lot of feedback from our users. Spencer: You know they’ll let us know hey this looks like an anomaly you know why is that? You know and so we are doing a lot of testing on our own and then of course getting feedback from users. And by and large our users are very-very happy with the results and they feel like they are very-very accurate. Steve: Okay and so let’s walk through a complete example. Steve: So let’s say I wanted to start a niche ecommerce store. How does one use the LTP to find these opportunities and kind of walk me through the basic strategy and in sequence? Spencer: Yeah, so what you would do is initially you have to start with some sort of seed keyword, right? Spencer: Or seed keywords. And so you know if you have an idea for an ecommerce store already, of course you would input sea keywords related to whatever that is. Steve: Let’s do survival knives because you might know a little bit about that. Spencer: Related to survival knives, so of course yeah you are going to input survival knives. And then if you go over to if you want to just I like to use things like Amazon and eBay that might list a bunch of survival knives. So if I go over to Amazon or eBay it might you know list something like tactical knives or pocket knives or you know hunting knives. So you know you can get five or six or ten sort of related phrases and then you just input all of those into Long Tail Pro. And what that will do is then generate 800 related keywords for each of those seed keywords. So you know if you input survival knife it will give you 800 keywords. If you input tactical knife it will give you 800 keywords. And then you’ve got this huge list of keywords that you can then start to narrow down. And using Long Tail Pro you can filter based on– if you only want to see keywords that get over a 1,000 searches a month and less than 25,000 searches a month you can input those filters. And there is other filtering options such as how many words are in the phrase? Or how much advertisers are paying for that keyword? So you would want to filter that down. I would usually say keywords you want over a 1,000 searches a month. Usually the keywords that are paying the most have a cost per click of over 50 cents or sometimes a dollar. Spencer: And that’s going to narrow down your options significantly, right? Steve: So how do you determine the thousand searches? Like how much traffic do you assume that you can be able to get with a 1,000 searches for example? Spencer: Yeah so that’s really just a base you know. And every niche is going to be different for how many searches you get. But if you only got traffic from that one keyword that got a thousand searches a month, you know if you are ranked to the top of Google they usually say you can get about 42% of that traffic. So that’s you know that’s only 420 visitors a month for that one particular keyword. But we know that you’ll get a lot related Long Tail keywords. And then of course once you build out other pages within the niche you’ll get more traffic just depending on what you are targeting. But it’s good to make that distinction somewhere. You want to whether that’s a 1,000 or you decide that’s 2,000 you want to have some sort of minimum so that you know you have a big enough niche that you are in. Spencer: And I’ve sort of drawn that line at a 1,000 for the sites that I build. Steve: Okay and so if you’ve chosen a primary keyword how do you kind of estimate the overall traffic including the long tail that you are going to get. Do you just kind of add up all the Long Tail keyword phrases that you can get or do you kind of make some estimate off of like a base keyword like survival knife for example? Spencer: Right and so you can do both. And there is no magic formula, I mean at the end of the day a lot of this is not a perfect science. Spencer: Because you’re going to get searches from Long Tail keywords that you didn’t expect or you know vice versa. So you want to look at yes the overall market. You know how many people are searching for a more general term like survival knife. And then but probably the better way is to kind of look at all the keywords that you are going to be targeting on your site and do some sort of calculation based on that. Steve: And okay so let’s say we have like some keywords that we want to target. Like you chose to target best survival knife, right? Steve: Do you mention the tool that it also speed out 800 related Long Tail keyword phrases, how do you use that data? Spencer: Yeah so once you’ve kind of filtered that data down let’s say maybe you are left with 100 keywords that kind of meet your search find criteria. And then at that point– a lot of these is a little bit of learning. Some people may go through every single one of those keywords, but just with my own experience I might be able to only look at 20 or 30 of those just from knowing hey this probably isn’t a good keyword phrase, and that comes through experience. But then you start once you’ve narrowed down at least you then start looking at how difficult would that be to rank in Google. And so this where that keyword competitiveness calculation comes into play. You in Long Tail Pro you could just click the calculate casey [ph] button next to each of those keywords, and it’s going to give you a number between zero and 100 to let you know how easy or difficult those keywords are. Spencer: And so you know that’s probably what you would want to do is go through there and then sort of sort them by easiest to rank for in Google. And then you probably want to actually look at the actual results in Google and kind of make it the final determination based on what you see in Google. And you know just what the keyword is if you feel confident writing about it, does it make sense that sort of thing. Steve: Okay and so once you have these keywords I guess what’s natural then is a blog or some sort of content based medium to actually try and rank for those words with content, is that…? Spencer: All of my sites are content based and so you know if we pick best survival knife like I did I created you know a nice informational article about what might be the best survival knife. I created a chart with the top 50 knives that you know users could then sort by reading and reviews and price and all sorts of other things. So you want to create a great resource that people can come to and actually use. And then you’ll do that across basically every keyword that you target on your sight, you want to create a new article, a new piece of content that can rank in Google, and people can read and find information from. Steve: Okay and in terms of commercial intent do you have any guidelines? Do you look at the search results to determine commercial intent or is it based on the AdWords cost per click that people are paying? Spencer: Right. So I usually I’m looking at the AdWords cost per click. Spencer: And well and two things, so the AdWords cost per click and the amount of advertisers that you know are bidding on that keyword. So if you have a high cost per click and there is lots of advertisers you will know that that’s commercial keyword, right? Spencer: Because there is a lot of advertisers there, whereas even if you have a high cost per click and there is only one or two advertisers that probably is not a super commercial keyword, just because there is not lots of advertisers. So you kind of want to have both if you can. That’s what I look at and again most of my sites are informational. I’m not creating ecommerce sites like you usually are or maybe your readers are. So there maybe some things you do slightly differently you know just depending on what of type of site you are creating. Steve: Yeah I was just more curious on how you would tailor your strategies for ecommerce, like if you were actually trying to sell a physical good to somebody. But I know you haven’t really done it, but I was just curious what your take and using Long Tail Pro for that purpose basically. Spencer: Yeah so I mean I think you know using those metrics that I mentioned you know, so the amount of advertisers and the cost per click that’s going to give you a really good idea of how commercial that keyword is. Spencer: But then certainly I mean it’s just natural that if you are building an ecommerce site you are going to want to focus on keywords that are more product based instead of informational based most likely. Steve: Okay and then I know your strategy has evolved recently or relatively recently to more targeting authority type of sites. So if you were to start all over today from complete scratch what would be some of you advice to readers out there who are trying to create a profitable niche site. Spencer: Right, the big difference I guess between then and now looking at my own timeline is just that I pursued a lot of short lived tactics, I was just trying to ranking quickly ranking Google as quickly as possible and wasn’t concerned with the long term longetivity of the site. And so that would be my advice is that people out there should try and build something that’s going to be around for years to come. Spencer: And expect that to be the case because that’s going to get you the most bang free your buck over the long term. And it will take a little bit longer to rank a larger site or an authority site if you will in Google. But it’s something that once you do it, it should be there for a long time. And so that would be my advice is don’t try to focus on short lived tactics. Try to focus on quality, how can you actually help your users, and build out a really great resource that you are proud to show other people. Steve: So does that imply that you kind of advocate targeting some of the more competitive keywords at this point if you are going to be in it for the long haul? Spencer: No-no that’s a great question. It’s a great question. You know there is lots of different– you know each website will end up targeting lots of different keywords you know. Again if we go back to my best survival knife site, so I may start off by targeting much lower competition keywords and that is what I advocate is still try to target very low competition keywords because that will help you rank quicker. But in the long term if you build up a great resource you might be able to rank for the keyword like survival knife or these more competitive keywords. So I would still start with the lower competition keywords but long term if you build a great enough resource you can potentially start ranking for these bigger keywords. Steve: Okay so if I can just summarize what you said, so you use Long Tail Pro and you have it spared a bunch of Long Tail keywords, which tend to be low competition, right because of the longer tail and then you start writing pieces of content that’s specifically tailor those long tail keywords and then gradually over time you should start ranking for some of the more competitive keywords as everything gets indexed. Is that kind of accurate? Spencer: That’s correct and as your site gets more authoritative maybe you weren’t targeting some of those more competitive keywords, you can then do so once you have that authority. So whether it’s your old articles that may be start ranking for competitive keywords, or if you create new articles to start ranking for those you can do that as well. Steve: Okay and I get this question all the time in my class so I thought I’d ask you as well. People often ask me how long things will take to actually even show up or get ranked in search. And if you’ve done your niche research properly and you’ve used the guidelines in Long Tail Pro, what is the shortest period of time that you’ve ever seen something rank like in the front page? Spencer: Yeah and this varies greatly from market to market. Spencer: I’ve seen things rank as quickly as within a month. Spencer: That is not the norm you know that sort of if somebody picks an extremely low competition keyword and anyway everything falls into place. Usually the norm is going to be four to five months. Spencer: You know before things start to really show up very well in Google. There just tends to be a longer waiting period now. Google takes a little bit longer usually to start ranking things. Steve: Okay and then in terms of your overall SEO back linking strategy, it sounds like– I know the answer to this question but I thought I’d ask anyways. Do you do anything gray hat at this point? Now I would consider PBNs almost gray black hat but do you do anything kind of in the fringe right now for your sites? Spencer: You know I’ve become pretty boring now. You know I used to be pretty involved in sort of the fringe I guess link building strategies. But I have given all of that up. You know I’m just honestly outbuilding great content. We are emailing people directly. We are you know just producing content that can be shared, that’s about it. You know we are not doing anything sort of shady or questionable if you will. Steve: Okay so at this point basically your strategies sound like it’s a lot of outreach, producing great stuff that people actually want to share and link to as opposed to any short term tactics like PBNs and that sort of thing. Spencer: I know I’m sorry. Steve: Because you know Glen Allsopp, right? Steve: He is been putting a link of some of his articles but he’s been talking about PBNs and all these other stuff that he does. And he’s been like pointing out specific examples of larger companies doing some shady tactics and getting away with it. So it’s just interesting that you guys are like complete opposites. Spencer: Yeah I mean we used to be similar in the fact that we both use PBNs and he did a huge basically in response– I did a huge blog post about you know I’m no longer using PBNs and sort of the next day he had a big response blog post and says, “I am still using PBNs.” So that was kind of fun so Glen and I did a little back and forth but that’s fine. You know everybody has their own tactics and their own opinions about what they should do. I’ve just you know I’ve been in this game long enough and I’ve seen the ups and downs of what can work in Google long enough. Spencer: That I’ve just decided you know what I’m going to do what Google really wants me to do, I’m going to just produce great content and give links naturally. Steve: Okay and then the final question I want to ask you is you’ve done a lot for ranking niche sites, for affiliate marketing and just AdSense and that sort of thing. But just curious how come you haven’t given physical products a try just yet? Spencer: You know I think a big reason that I never got involved in physical products and this could be totally a wrong reason I guess is that I was drawn to affiliate sites and AdSense sites because of the hands off nature of them. You know it’s something that I don’t have any customers, they click the link and I get paid and that’s it. You know I don’t have to do customer service and everything else that’s involved. Whereas a physical product I felt like it was just more hands on work, more dealing with whether that’s returns or emails from customers and that sort of thing. That’s I mean that’s the reason is really it seemed more hands on and you have to remember back in the day I was building out you know dozens and dozens of these niche sites. That was my focus was just building out the next big site, I don’t want to be back answering customer emails. Spencer: In regards to that. Steve: Although you could argue that Long Tail Pro prior requires a lot of support, right? Spencer: Sure absolutely no it does. It does, and so I don’t know if I have a good reason for not keeping physical products at this point. Spencer: No I’ve been very intrigued with ecommerce sites; I just have never done it up to this point. Steve: Okay, sounds good man. So hey Spencer we’ve already been talking for quite a while. Where can people find you and learn more about your tools and the niche sites that you’ve been working on? Spencer: Yeah so the best place really is for people to go to my blog over at nichepursuits.com and in addition I’m on Twitter @nichepursuits and if they want to go directly and find out about Long Tail Pro they could go to Longtailpro.com. Steve: Okay, sounds good Spencer. Hey I really appreciate the time and it was great talking. Spencer: Awesome thank you so much, and for everybody listening just yeah thanks I appreciate it and hopefully everybody learnt a thing or two. Spencer: Hey thanks a lot will see you. Steve: Hope you enjoyed that interview. What I like about Spencer is that he is constantly trying new things to test the limits of SEO. And he’s created by far the best keyword research tool out there with Long Tail Pro. Now what’s also cool about Spencer is that he is not a programmer yet he has managed to create a fairly complex piece of software. For more information about this episode go to Mywifequitherjob.com/episode54, and if you enjoyed listening to this episode please go to iTunes and leave me a review. When you write me a review it not only makes me feel proud, but it helps keep this podcast up in the ranks so other people can use this information, find the show very easily, and get awesome business advice from my guests. For more information go to Mywifequiteherjob.com/contest and if you are interested in starting your own online business be sure to sign up for my free six day mini course where I show you how my wife and I manage to make over 100k in profit in our first year of business. Go to www.mywifequiherjob.com for more information and thanks for listening. Love this podcast as I am a big fan of both Spencer and yourself :). And love Spencers new blog design too. Just a question, Why is the transcript last in this episode? WOW. absolutely love your website, Spencer, and what it provides. I also entered your contest 🙂 and Steve, thanks for bringing to us the topnotch guests + the vital web business tools. You rock. i have created software like long tail pro and it will exact result of keyword competitiveness, as in long tail pro. so should i make it open source or just free for use.